Peaches... canned with 1 part sugar and 4 parts water for a tiny bit of flavor, but not much sweetness (when you wait for the peaches to be almost over ripe, you rarely need much but a tad to bring out the flavor anyway). I did the first batch with the same syrup ratio, but then added 2 tea of Sigon Cinnamon to the mix. Cyan had some of those for dessert and said they were perfect. She is now excited that we will have peaches all winter. lol... kids are great support sometimes. It kept me going for the rest of the day on these. 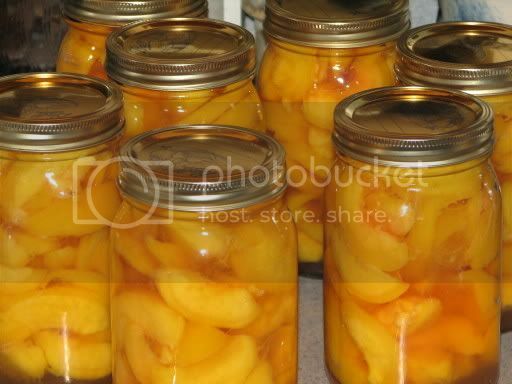 I now have just over 20 quarts of sliced peaches. Two boxes down, one to go.